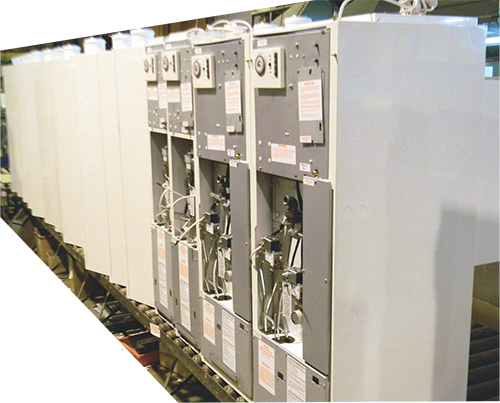 Johnson & Starley Ltd. manufactures energy-efficient heating and ventilation equipment. Sheetmetal panels, the majority 0.9- and 1.2-mm mild steel, are punched using semi-shearing, hole-punching and embossing tools. At Johnson & Starley Ltd. (J&S), Northampton, UK, a manufacturer of energy-efficient warm-air heating and ventilation solutions, new CNC punch-press tool-sharpening equipment (a Premia model from Mate Precision Tooling) has brought about major improvements in tooling maintenance, while increasing the readiness of tooling for ongoing punching projects. Not much of a headline grabber in fabricating circles over the years, tool sharpening was an activity fabricators performed merely to “keep on punching.” All of that is changing, at J&S and other fabricators, as they focus more attention on sharpening as a way to make the punching process faster and more precise and repeatable. This new era in tool sharpening also meshes well with continuous-improvement programs, and J&S exemplifies that ideal by experiencing measurable results that translate into bottom-line improvements. With its new tool-sharpening machine in place, J&S has realized many benefits, including reduced maintenance time, extended tool life and making the sharpening chore far simpler for workers to perform. J&S employs its new tool-sharpening system to return dies and punches to near-new condition. 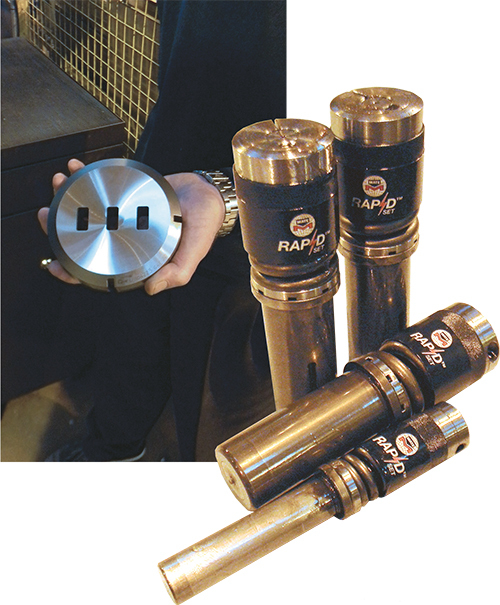 Shown are the Mate cluster die and Rapidset (adjustable punch length) tools used in the firm’s sheetmetal-fabrication shop. “Our continuous-improvement program had us looking at all areas of our fabricating operations, and tool sharpening came under scrutiny,” says Chris Yates, J&S managing director. “When we discussed this with our Mate Tooling representative, Craig Letty, he recommended upgrading to the Premia system. The new sharpening machine includes a 12.60-in.-dia. rotary table that tilts from 0 to 12 deg. ; 3.3-kW motor; 7.8-in.-dia. 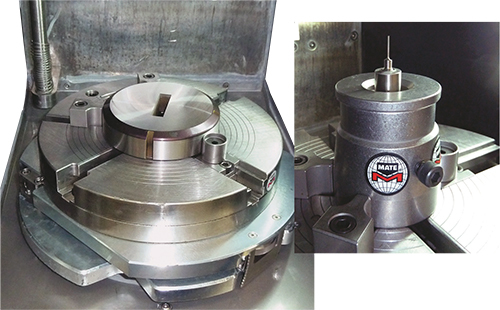 grinding wheel with through-the-wheel coolant delivery; and a dual-stage filtering process. Among the punch-press tools used at J&S: shearing, semi-shearing, hole punching and embossing. Workpiece materials comprise mild and stainless steels, with the majority being 0.9- and 1.2-mm mild steel. J&S’s Premia tool-sharpening machine handles large station dies (left) as well as small-diameter punches (right). Using the Premia, a typical tool-sharpening process at J&S has been reduced from an average of 25 min. to just a couple of minutes. The new tool-sharpening system has eliminated burrs on part edges, and the Premia system accommodates even the smallest punches without danger of breakage—a problem previously experienced at J&S. The Premia system features a touchscreen interface that simplifies tool setup and maintenance operations. Menu-driven, the interface offers three standard programs for small, medium and large tools, plus two customizable programs. J&S operators use the small and medium programs plus an additional program for tool diameters less than 0.8 mm. And, they can use the machine’s manual operating mode if required. Operating the sharpening machine, an operator mounts the tool in a universal fixture that accommodates all popular tooling styles. Essentially, all he needs to do is insert the tool in the fixture, select the appropriate program from the menu and press the start button. During operation, the software tracks several datapoints. J&S records data on all of the tools sharpened; monitoring wheel and coolant life, motor history and grind depth. And, the software can provide an estimated time to completion. Article submitted by Mate Precision Tooling: www.mate.com.